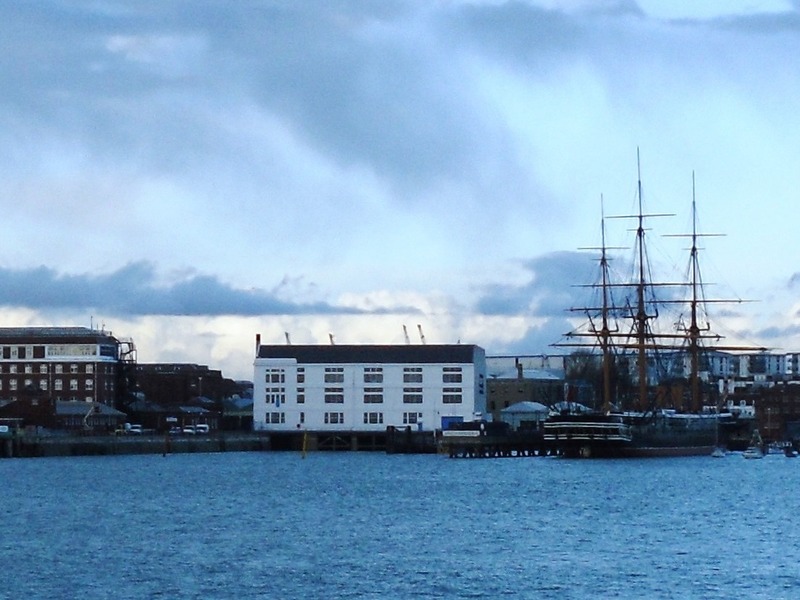 Some 500 adults and families are to have the opportunity to receive training in traditional boat and shipbuilding skills at Portsmouth’s Boathouse 4, I have been told by Portsmouth Naval Base Property Trust projects coordinator Abi Isherwood. Up to 85 students will be able to attend 47-week full-time courses courses provided by IBTC Portsmouth, a new charity to be operated by Nat Wilson of IBTC Lowestoft – Graduates will leave with valuable transferrable skills, equipping them for work in the maritime industry or indeed the wider heritage sector. I gather seven bursaries will be available each year for those with enthusiasm and aptitude. The figures Nat gave me don’t quite line up, but he’ll know best. He says the projected numbers are year 1, 35 students; year 2, 45; year 3 60; and probably plateauing out at about that. He notes that these totals will include those doing the course for their own interest, those just taking a year out, those from abroad who will return to their country of origin and those who will move sideways into transferable skills jobs such as furniture making or green frame timber house building. Therefore, probably only 20-25 per cent of successful students will be looking for a career in the traditional boatbuilding sector and even some of these will go abroad, as do our existing students. And I’m also told that Portsmouth’s Highbury College will also be delivering boatbuilding and engineering courses at Boathouse 4. Apprenticeships are not on offer, but may be an option later, says Abi. More information including details of courses is available from IBTC chief exec Nat Wilson at tel 01502 569663, email ibtc2@btconnect.com and the IBTC website. In partnership with Portsmouth Naval Base, the new charity IBTC Portsmouth, is delighted to have been awarded a 3.8 million grant from the Heritage Lottery Fund and a further £ 455,000 from the Regional Growth Fund which will enable us to establish a south coast centre of our renowned College, in Boatshed No 4, Portsmouth Historic Dockyard. The IBTC at Oulton Broad will continue to operate alongside the new centre in Portsmouth, working together to increase our profile, prestige and marketing efficiency. At Oulton Broad and in anticipation of this event, we have taken a number of measures to augment what we already do. These include, the establishment of National Historic Ship’s UK East Anglian Hub for the Shipshape Network, a major Coastal Communities Fund bid and applying for charity status. The CCF project will build our links with the Excelsior Trust, Lowestoft and access to its facilities, build and expand on the Hub concept, improve footpath access and establish a water taxi to run between Oulton Broad and the Heritage Quay in Lowestoft. We will also build on our sawmill facility to provide reasonable priced native timber to boat builders and furniture builders in the region. Our landlords, Tilia Properties are also committing funds to major refurbishment works to our building including new insulated roofs, wall cladding and new doors and windows throughout. Whilst the Portsmouth project is a fantastic chance to spread our training to the centre of south coast yachting and boatbuilding, we see our Oulton Broad branch catering for those living north of the M25, and northern Europe and Scandinavia. Here we offer a quieter more relaxed atmosphere than will be possible in the busy tourist attraction of Portsmouth’s Historic Dockyard. Portsmouth Naval Base Property Trust (PNBPT) is delighted to have received a grant of £3.75m from the Heritage Lottery Fund (HLF) for its Boatbuilding & Heritage Skills Training Centre project, announced today. 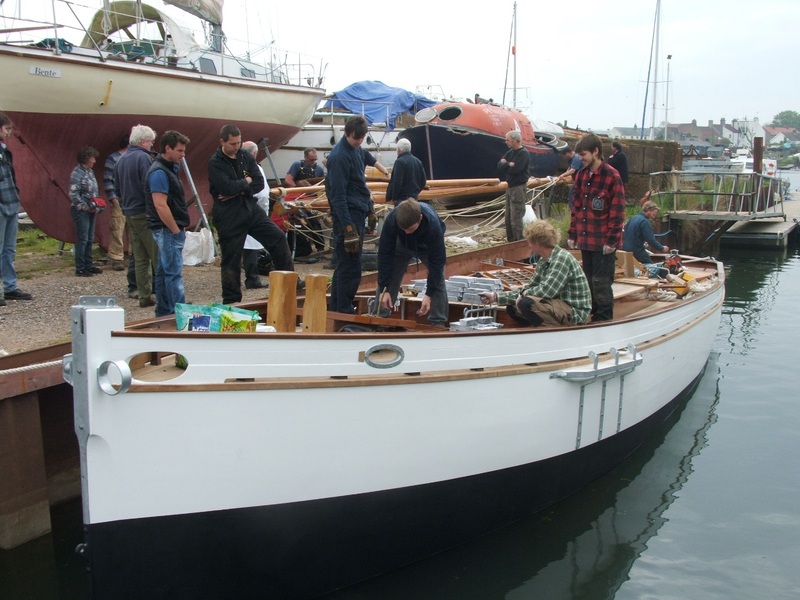 The project, which focuses on preserving and celebrating valuable traditional skills, will be delivered by PNBPT and the IBTC Portsmouth, the new, south coast branch of the long established International Boatbuilding Training College, specialists in traditional boatbuilding training. The Centre will open its doors to the public and begin training in April 2015. Boathouse 4, an iconic building within the Historic Dockyard constructed during the massive 1930’s rearmament period, will be restored and opened to the public as the Boatbuilding & Heritage Skills Training Centre. The Boathouse will become a Centre of Excellence for boatbuilding training, with IBTC Portsmouth and Highbury College delivering practical, intensive courses in traditional boatbuilding and related skills. The Centre will provide annual Heritage Bursaries, offering local people currently unemployed or disengaged with education the opportunity to undertake one year’s full time traditional boatbuilding training, leading to a City and Guilds qualification and an IBTC Portsmouth Diploma. Graduates will leave the Centre with valuable boatbuilding and engineering skills, enabling them to develop careers in the broader heritage and marine sectors. The Centre will also offer many opportunities for people to get involved with and learn about our maritime heritage, including short courses and family weekend programmes, sessions with local schools, a summer festival, and an extended volunteer scheme offering mentoring and skills training. Visitors will be able to watch traditional boatbuilding in action as well as enjoy fun, tactile and engaging exhibitions on the building and the fascinating story of small boats in the British Navy, including the display of several small craft from the Trust’s own collection. The Centre, based in the very boathouse used during World War 2 to construct the secret three man midget X-Craft submarine, will be the perfect setting for visitors to discover the astonishing history of small boats in the Navy, from Captain Bligh cast off the Bounty in a 23ft launch to Ernest Shackleton’s legendary voyage to South Georgia in the James Caird. As well as securing the future of Boathouse 4, the skills training opportunities delivered within this project will help to create the next generation of craftsmen to preserve iconic ships such as HMS Victory and HMS Warrior. 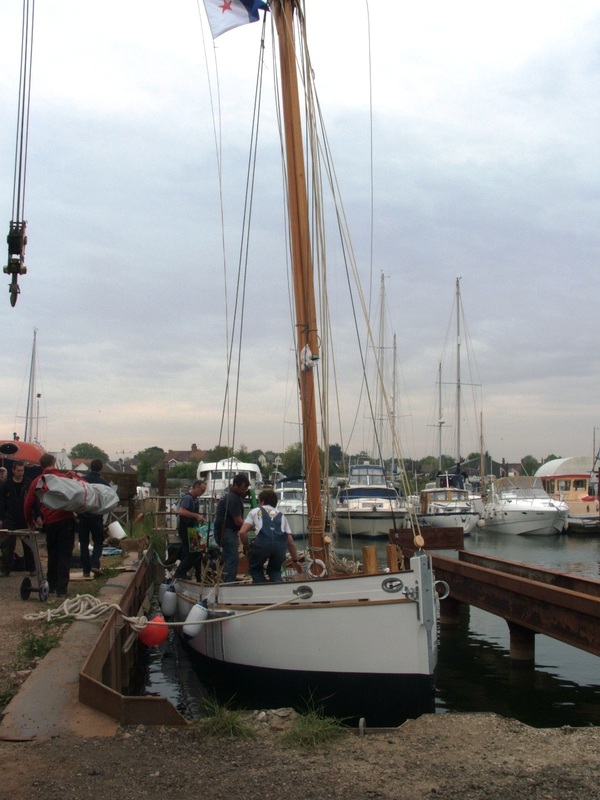 IBTC Portsmouth students will spend part of their course at the Shipwright’s School to be established at the historic shipbuilding village of Buckler’s Hard on the Beaulieu River, enabling them to further develop the skills required for the construction and restoration of larger vessels. The project has also received £479,000 from the Regional Growth Fund, a Government initiative supporting large projects with the potential to create long-term private sector jobs, as part of a £1.3m award towards PNBPT projects. 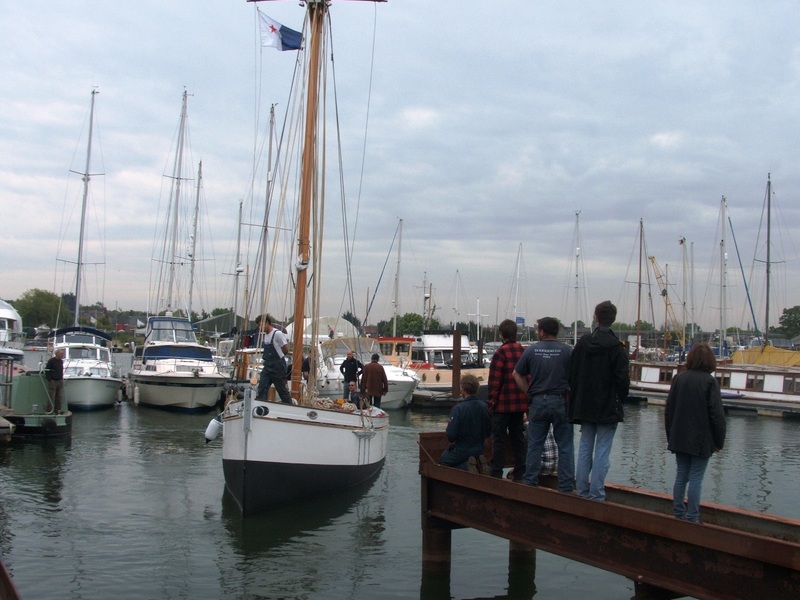 The 1882 Nicholson racing yacht Germaine has been relaunched following a long restoration at the International Boatbuilding Training Centre at Lowestoft. Once she is fully rigged and has her new suit of sails she will sail to her new home in Brittany. Germaine was designed by Ben Nicholson for a prominent racer, Mr FW Leybourne Popham. After being photographed by Beken, she sailed to the Med in December 1882 and returned in the spring of 1883, passed to Mr Harvey A Dixon, who rigged her as a cutter. She was later made into a yawl again, and passed through further changes of ownership – later owners were Major Middleton Robinson and Mr HW Whittingham of Goodmayes, Essex. In the early 60s she was found on the banks of the Blackwater by Ann and Peter Christgau, who refloated and cleaned her, and sold her in the mid-1960s. Eventually she returned to the Camper and Nicholson yard, where she was to be repaired ready for the yard’s bicentenary celebrations. Sadly the yard got into financial difficulties and the project had to be abandoned. 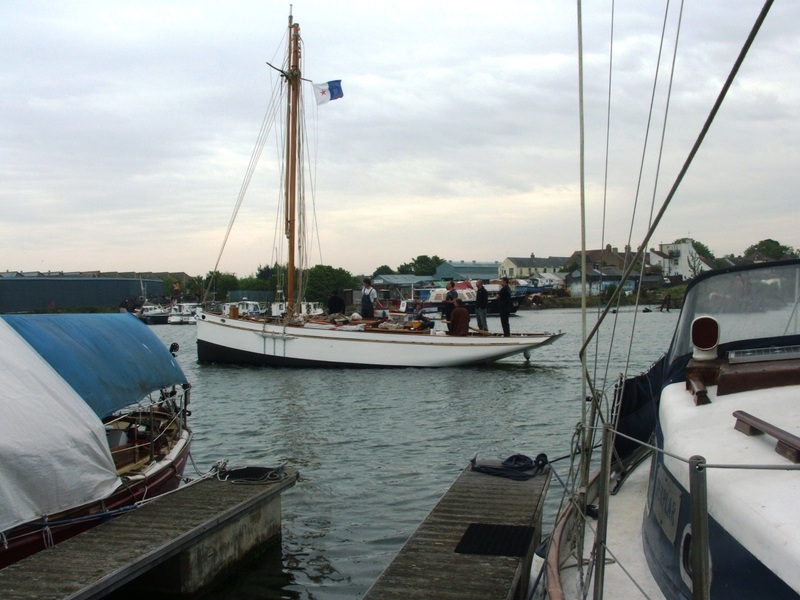 Germaine’s cause was then taken up by Patrick Bigand, who acquired her and transported her to the IBTC in 1997 for restoration. The restoration took quite some time, and I gather that she leaves quite a space in the College’s premises, having been there for two decades, but it must be wonderful for the staff and students to see her back on the water. PS – Donan Raven points out that there’s some good material about Germaine here – and that it includes a set of lines, two Beken photos and some shots of the IBTC restoration. Thanks Donan! I very much like IBTC student Philip Lane’s weblog – it shows a real pride in what he’s learning to do and what the college does, and boy does he adore the boats he works on. And so he should. They have included a pretty little rowing boat planked in larch, an 1882 Camper & Nicholson yawl, and 1882 Camper and Nicholson pilot cutter, an Aldeburgh One-Design dinghy, a Herreshoff Columbia dinghy, a River Cam dinghy, and a 1912 William Fife III Six Metre, and the Albert Strange-designed Cloud.